Editeur : New Wave Films. 2010. 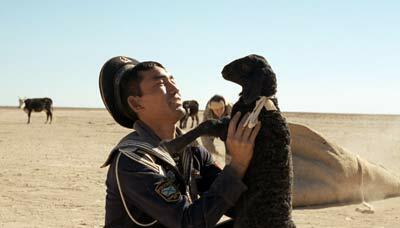 Recently discharged from the navy, Asa arrives in the barren regions of southern Kazakhstan. The first thing one needs for life on the plains is a good wife, and this is what Asa attempts to find. Only one potential bride lives nearby, named Tulpan, but she refuses the match, claiming that Asa’s ears stick out too much. Meanwhile, he helps out at her sister’s farm, where she lives with her husband and their four children. But being a sailor doesn’t exactly prepare you for a shepherd’s life, and Asa’s ineptness in this field creates constant conflict with his unsympathetic brother-in-law.